In schools this kind of snack is being sold because it's what most kids love. This one is a kid friendly, healthy snack because its main ingredient is banana. Wrap each in spring roll wrapper. Deep fry in boiling oil in batches. When color turns light brown, sprinkle each batch with brown sugar. Let sugar caramelize and coat around the each roll. When sugar starts to melt and caramelize, remove from pan to avoid overcooking. Best served with vanilla ice cream on top. I'm a little unclear on something. You don't mention removing the rolls from the oil before sprinkling with sugar (and then returning them to the oil to caramelize). I'm assuming the sugar is sprinkled on the rolls while they are cooking in the hot oil. Is this correct? 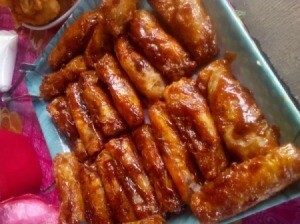 If my question seems lame, Turon is a new word for me. I thought it was a typo and should have been 'Turn On'. No, you remove them from the oil, and sprinkle with sugar while hot. The heat will melt (caramelize) the sugar, and make it liquid instead of solid. You dont put back in oil after adding sugar, it would all get washed away from the oil. It's okay not to remove the rolls from the oil, let them caramelize and coat while frying. Anyway, when the rolls are cooked you put them in a strainer to cool down a little bit and into a paper towel to remove excess oil. It won't come out oily. 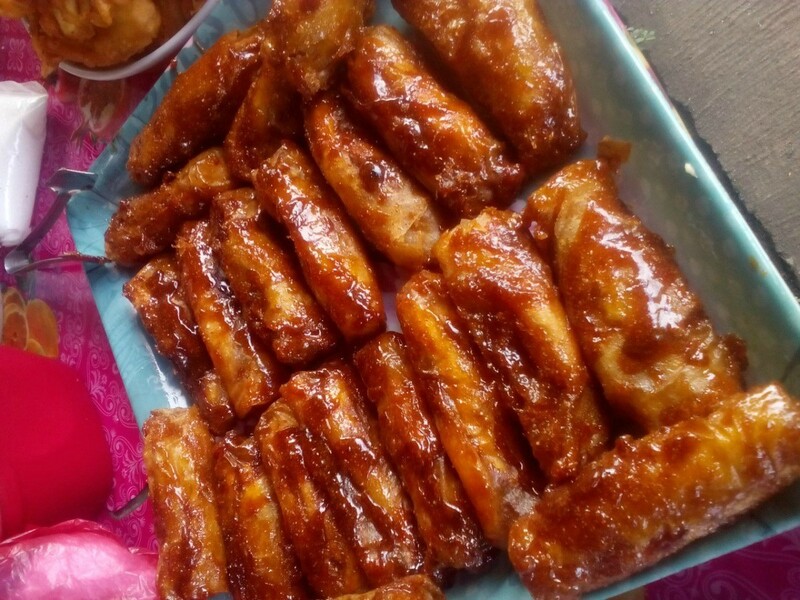 Another way to make Turon is to sprinkle the banana with a bit of sugar before you roll them. We use bananas with a touch of green peel because they are firm and not too sweet. Fry until nice and light brown, remove from oil, then a light sprinkle of sugar on them while the are still too hot to eat.